Earlier this year I applied to be a Google Education Trainer and one of the requirements is to submit a resume highlighting training sessions. Instead of the using the same old basic resume layout, I decided to take a different approach and create one in Google Drawings. Here are some ways to spice up your resume or curriculum vitae. I've linked a copy of my training resume and a sample to show some different aspects. Start by sketching a few mock ups on paper or in Google Drawings. The more planning, the easier it is to get the desired results. Need some inspiration? Search keywords like ‘Creative Resumes’ on Google. Also, you may want to create an outline of all the information you want to include in your resume. 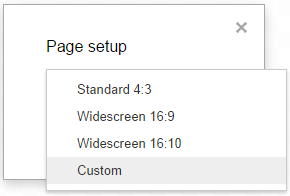 The first thing you'll need to do is set up your page size. I used the standard 8.5" x 11" page size. Decide whether you’re using a solid color, a gradient, an image or pattern. Solid colors are easy to do in Google Drawings otherwise you may need to enlist the help of other programs like Adobe Photoshop or Pixlr to help create some cool patterns or images. Don't be afraid to play with shapes. You can overlap them to get some nice effects. Add subtle effects to text using drop shadows. Simply copy and paste your text, change the color and move it into position. Tip: color the original with the shadow color first, then copy and paste. That will make it much easier to work with when trying to select the shadow text. Instead of using simple text, try using shapes. I like to use rectangles with text. To do so, create the shape and double-click to add text. Use some infographics to show your mastery of different subjects. An easy way is to create a shape and add text like the heading above but change the transparency of the layer below to show the level of knowledge. For more info on creating infographics with Google Drawings, here's a great post by Alice Keeler. Spruce up your layout with a picture of you or for a background image. Consider using a transparency to create a more subtle effect. Just don't overdo it otherwise it'll look like a students first experience with word processing. And as always, don't forget about usage rights with images from the internet. Here's a video for cropping images using custom shapes. By grouping objects together, you’ll be able to move and rearrange your layout more easily. Select the shapes to group by selecting Arrange and Group or Ctrl+G. Holding down the Shift button while moving or rotating objects will allow you keep things lined up or move at predefined angles. 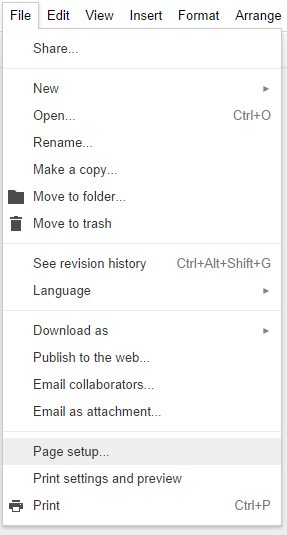 By holding down the Ctrl button while dragging, you can create copies of the object. In addition, if you hold Shift + Ctrl, you’ll be able to copy an object and constrain it at the same time. Very useful for repeating objects. 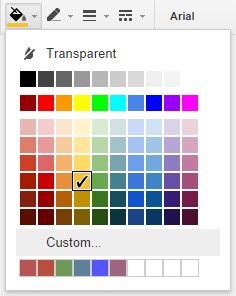 Google Drawings includes the option for creating custom colors including transparencies. You can create some cool effects by overlapping colors. 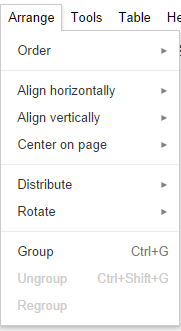 Some of the best layout features are located in the Arrange menu. Use Order to adjust what objects appear in front of others. Use the Align feature to adjust the vertical and horizontal placement of objects to one another. Finally, you can use the Distribute to create even spaces between objects. Good luck and share your examples. your blog is very informative. It is very interesting and i have enjoyed reading it The Pros And Cons of Writing a Life Plan Thank you for sharing your ideas..
Its quite interesting topic.I really appreciate your work.Well,I have a great blog for students to resume for high school graduate which will be excellent resume service. Free webhosting services are a bargain for a small hobby site, Dream Coupon Engine but are bound to be subject to glitches and technical problems and you cannot really complain as much since your not paying for their service anyway. It is a part of the Indiabulls group of companies (Net worth USD 4 Billion). The group achieved a Profit after tax of USD 225 million in the last financial year. Make a resume with google drawing is the best colorful system of creating resume.If you want to custom dissertation service job you can make resume with google drawing system. Actually, it is the only gizmo in this era which can be seen in the hands of each and every individual worldwide, whether it is in the form of tablets or iPhone. Remote tech support does not urge you to sacrifice your comfort and your technical troubles are resolved while you sit comfortably at home - no surprise if the tech support buyers see this as the best part of hiring these services.